Smythen Barton is an amazing detached contemporary property, superbly converted from a former barn to a high specification. It is set beautifully in a rural location about half a mile to the east of the small picturesque village of Hollocombe, standing high and enjoying magnificent rural view across rolling Devon farmland with the hills of Exmoor in the distance. The larger village of Winkleigh is about three miles and offers primary education, shops, public houses and garage. Further education and a further range of amenities are available in the local town of Chulmleigh (4 miles). Winkleigh is a gem, concealed deep within the rise and fall of the Mid Devon hills. As far as villages go it is quite large and has a strong communal atmosphere, whilst still retaining many of its unique traditions (including an annual 750 year old country fayre). Winkleigh has many facilities, including: 2 pubs, a post office, general stores, a butchers, a fishmongers, a vets, a doctor’s surgery, mechanics garage, a primary school, a chapel, sports centre, village hall and community hall…certainly enough to satisfy. For history enthusiasts the village is home to the ruins of two 12th Century castles – the only village in Devon that is. The closest supermarkets are in the town of Okehampton about 11 miles away, where access to the A30 dual carriageway is also found (a direct route to Exeter). CHULMLEIGH is a small town on high ground with Saxon origins, it has an impressive range of shops / facilities: a bakery, butchers, deli/café, newsagents with post office, 2 pubs serving food, a bistro, tandoori restaurant, a primary school, Chulmleigh Community College, which ranks highly in the GCSE league tables, a health centre, dentist, library, golf course, two churches, a sports club and more. The accommodation is well designed, and spacious, with the living room having a vaulted ceiling and full height glazing, giving a real “wow” factor! Central heating is provided by an oil fired underfloor system, and there is double glazed units throughout. 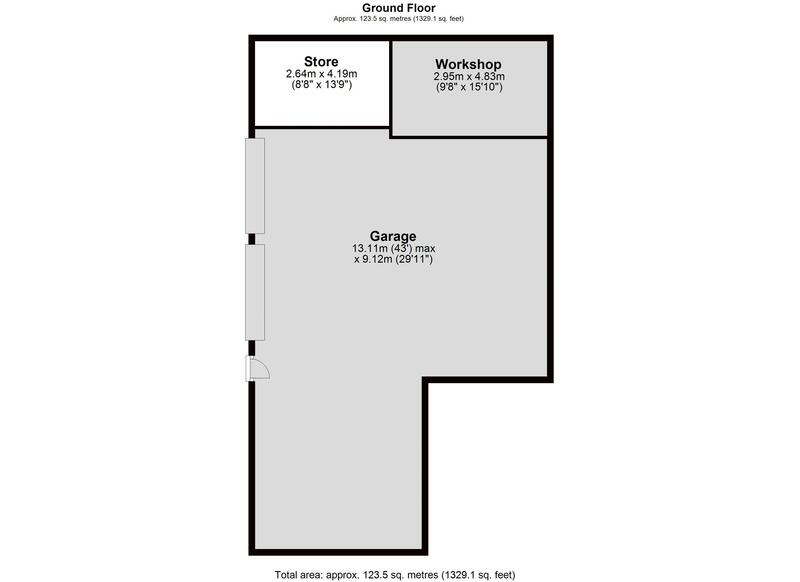 The layout and room dimensions are as per the floorplan. The UTILITY ROOM has a slate floor and range of units with worktops, tall end units and stainless steel sink unit. Off the utility is a CLOAKROOM with WC and wash basin. 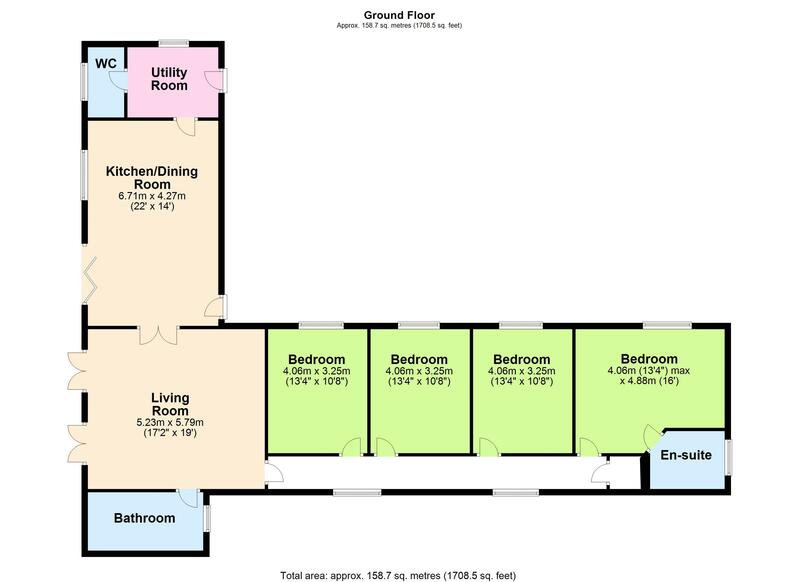 There is an open plan KITCHEN/BREAKFAST ROOM with slate tiled floor, superbly fitted with a range of units with worktops over, 1½ bowl sink unit and integrated appliances include dishwasher, double electric oven with plate warming oven, fridge and freezer and an island unit with 5 ring hob and extractor over. The kitchen area opens out into the dining area that has wide bi-fold doors to a paved terrace to the front with fine views away over rolling farmland. Through glazed double doors is a vaulted LIVING ROOM with floor to ceiling glazed doors and windows to the front and taking full advantage of the views. There is a fitted wood burner on a slated area between the doors. Off the sitting room is a fully tiled BATHROOM, superbly fitted with a free-standing bath, pedestal wash basin and close coupled WC as well as a large glazed shower area. The INNER HALL has doors off to the FOUR DOUBLE BEDROOMS with the MASTER BEDROOM having a superb EN-SUITE SHOWER ROOM. Smythen Barton has two driveways, one leading to the rear of the property to a gravelled parking area and to the main door. Another driveway continues past the front of the dwelling to a large, gravelled parking area for numerous vehicles, and to a LARGE GARAGE BUILDING with integral WORKHOP/STUDIO ROOM and WATER STORAGE/TREATMENT ROOM. From Crediton take the main road to Winkleigh. Continue on the A3124 passing by the sports hall, and take the next right on a sharp left hand bend as signed Hollocombe. Follow the lane, taking the 3rd turning on the left at Tinkers Cross as signed Hollocombe. Follow the lane, and Smythen Barton will be seen on your left.